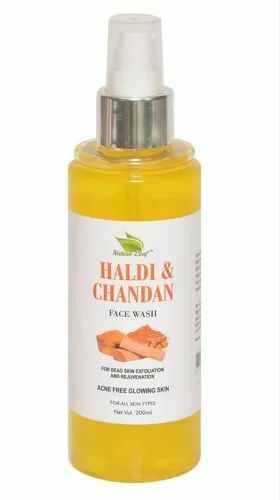 Nature Leaf Haldi and Chandan Face wash contains Turmeric .It has antioxidants and anti-inflammatory properties which treats the acne and pimples . It provides glow and luster to the skin. Turmeric revive your skin by bringing out its natural glow. It remove the dead skin cell . Chandan has a soothing and calming effect on the inflammation of skin caused due to pimples and acne. It leaves the skin to be blemish-free .It gives you instant glow to face. Soft Touch Enterprises is a leading manufacturer of innovative products for the Personal and Home care industry based on Indian herbals.Our Skincare and Personal care product are chemical and paraben free. We believe in creating responsible chemistry between us and customer . We have chosen to remain close to Personal & Home Care Business. Choosing the industry is just the beginning Nature Leaf( unit of Soft Touch Enterprises ) brand is well known in FMCG market. We serve the consumers across all walks of life and all across India . At Nature leaf, Personal Care, our highly skilled Formulation & Applications team is dedicated to partnering our customers every step of the way towards a successful product launch, in a spirit of creativeness based on solid, consistent and reliable technical competence.